The pictures of the skirt were taken over a week ago – I wore it literally a few hours after it was done, and had the opportunity to be photographed in a park after I came home from work, just before the sun set. Hence the wrinkles, but hey, that’s what real life is made of. Nothing much to say about the pattern, really. 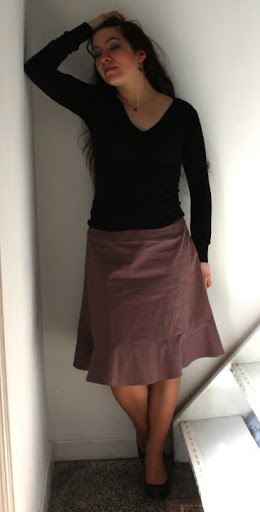 Simplicity 2655 is a variation on a six-gored yoked skirt, in two different lengths and with optional flounces, pockets and ties. The back and front panels are identical – only the yoke varies slightly from front to back. I made view C, the knee-length version with a flounce, but omitted the tie at the waist. I cut the skirt in a size 8 all around but had to take in the back to my usual size 6. It’s still a bit big at the waist, probably due to the fact that the fabric has a very slight stretch; but I’m not unpicking the yoke facing and understiching (and invisible zipper) to take it in again. The skirt looks really cute & fun , and the park seems very pretty! Very pretty! Nice park setting as well. Very pretty skirt and wonderful park. The skirt looks perfect and I have come to expect perfect fits from you on everything you make.You are so very talented. That's a pretty skirt. Classy and classic. Such pretty pictures! And very nice skirt. great skirt! fun and flirty. Ditto above comments. Great skirt. You live in a beautiful area. That must make for a terrific life. Bonjour, Elle est superbe cette jupe! Je prends en note le numéro car j'étais justement à la recherche d'un patron dans ce style…à suivre. Ta jupe a l'air très agréable à porter, très fluide. 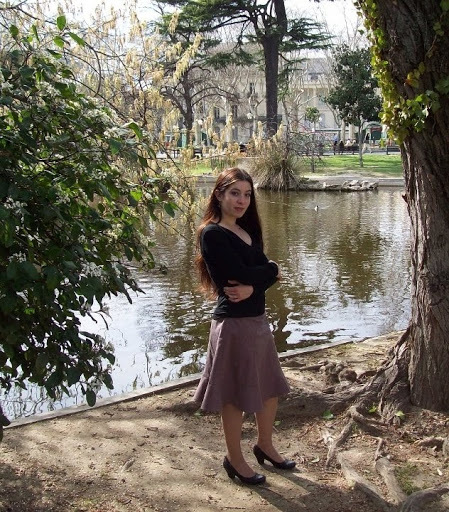 Very very nice skirt and beautiful park setting. J'aime beaucoup ta jupe avec son petit volant tout discret ! Et oui, tu fais bien de profiter du beau temps quand il est là, le printemps n'est vraiment pas pressé de s'installer dans le sud ! tu es très jolie sur ces photos!